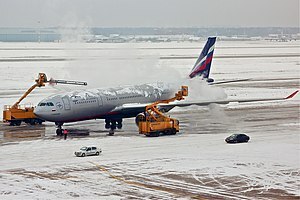 An Aeroflot Airbus A330 being de-iced at Sheremetyevo International Airport. De-icing can be accomplished by mechanical methods (scraping, pushing); through the application of heat; by use of dry or liquid chemicals designed to lower the freezing point of water (various salts or brines, alcohols, glycols); or by a combination of these different techniques. Ice build up in train brakes jeopardizes braking efficiency. Trains and rail switches in arctic regions have large problems with snow and ice build up. They need a constant heat source in cold days to assure functionality. On trains it is primarily the brakes, suspension and couplers that require heaters for de-icing. On rails it is primarily the switches that are sensitive to ice. These high-powered electrical heaters efficiently prevent ice formation and rapidly melt any ice that forms. The heaters are preferably made of PTC material, e.g. PTC rubber, to avoid overheating and potentially destroying the heaters. These heaters are self-limiting and require no regulating electronics; they cannot overheat and require no overheat protection. On the ground, when there are freezing conditions and precipitation, de-icing an aircraft is crucial. Frozen contaminants cause critical control surfaces to be rough and uneven, disrupting smooth air flow and greatly degrading the ability of the wing to generate lift, and increasing drag. This situation can cause a crash. If large pieces of ice separate when the aircraft is in motion, they can be ingested in engines or hit propellers and cause catastrophic failure. Frozen contaminants can jam control surfaces, preventing them from moving properly. Because of this potentially severe consequence, de-icing is performed at airports where temperatures are likely to be around 0 °C (32 °F). In flight, droplets of supercooled water often exist in stratiform and cumulus clouds. They form into ice when they are struck by the wings of passing airplanes and abruptly crystallize. This disrupts airflow over the wing, reducing lift, so aircraft that are expected to fly in such conditions are equipped with a de-icing system. De-icing techniques are also employed to ensure that engine inlets and various sensors on the outside of the aircraft are clear of ice or snow. Anti-icing of aircraft is accomplished by applying a protective layer, using a viscous fluid called anti-ice fluid, over a surface to absorb the contaminant. All anti-ice fluids offer only limited protection, dependent upon frozen contaminant type and prevailing weather conditions. A fluid has failed when it no longer can absorb the contaminant and it essentially becomes a contaminant itself. Even water can be a contaminant in this sense, as it dilutes the anti-icing agent until it is no longer effective. Direct infrared heating has also been developed as an aircraft de-icing technique. This heat transfer mechanism is substantially faster than conventional heat transfer modes used by conventional de-icing (convection and conduction) due to the cooling effect of the air on the de-icing fluid spray. Another infrared system uses mobile, truck-mounted heating units that do not require the use of hangars. The manufacturer claims that the system can be used for both fixed wing aircraft and helicopters, although it has not cited any instances of its use on commercial aircraft. Urea mixtures have also been used for pavement de-icing, due to their low cost. However, urea is a significant pollutant in waterways and wildlife, as it degrades to ammonia after application, and it has been largely been phased out at U.S. airports. In 2012 the U.S. Environmental Protection Agency (EPA) prohibited use of urea-based deicers at most commercial airports. De-icing of roads has traditionally been done with salt, spread by snowplows or dump trucks designed to spread it, often mixed with sand and gravel, on slick roads. Sodium chloride (rock salt) is normally used, as it is inexpensive and readily available in large quantities. However, since salt water still freezes at −18 °C (0 °F), it is of no help when the temperature falls below this point. It also has a strong tendency to cause corrosion, rusting the steel used in most vehicles and the rebar in concrete bridges. Depending on the concentration, it can be toxic to some plants and animals, and some urban areas have moved away from it as a result. More recent snowmelters use other salts, such as calcium chloride and magnesium chloride, which not only depress the freezing point of water to a much lower temperature, but also produce an exothermic reaction. They are somewhat safer for sidewalks, but excess should still be removed. More recently, organic compounds have been developed that reduce the environmental issues connected with salts and have longer residual effects when spread on roadways, usually in conjunction with salt brines or solids. These compounds are often generated as byproducts of agricultural operations such as sugar beet refining or the distillation process that produces ethanol. Other organic compounds are wood ash and a deicing salt called calcium magnesium acetate made from roadside grass or even kitchen waste. Additionally, mixing common rock salt with some of the organic compounds and magnesium chloride results in spreadable materials that are both effective to much colder temperatures (−34 °C or −29 °F) as well as at lower overall rates of spreading per unit area. Solar road systems have been used to maintain the surface of roads above the freezing point of water. An array of pipes embedded in the road surface is used to collect solar energy in summer, transfer the heat to thermal banks and return the heat to the road in winter to maintain the surface above 0 °C (32 °F). This automated form of renewable energy collection, storage and delivery avoids the environmental issues of using chemical contaminants. It was suggested in 2012 that superhydrophobic surfaces capable of repelling water can also be used to prevent ice accumulation leading to icephobicity. However, not every superhydrophobic surface is icephobic and the method is still under development. A deice operation via a FMC Technologies' Tempest deicing unit. All chemical de-icers share a common working mechanism: they chemically prevent water molecules from binding above a certain temperature that depends on the concentration. This temperature is below 0 °C, the freezing point of pure water. Sometimes, there is an exothermic dissolution reaction that allows for an even stronger melting power. The following lists contains the most-commonly used de-icing chemicals and their typical chemical formula. Anti-icing fluids: unheated, undiluted propylene glycol based fluids that has been thickened (imagine half-set gelatin), also referred to as non-Newtonian fluids (owing to their characteristic viscous flow), applied to retard the future development of ice or to prevent falling snow or sleet from accumulating. Anti-icing fluids provide holdover protection against the formation of ice while the aircraft is stationary on the ground. However, when subjected to shearing force such as the air flow over the fluid surface, when an aircraft is accelerating for takeoff, the fluid's entire rheology changes and it becomes significantly thinner, running off to leave a clean and smooth aerodynamic surface to the wing. In some cases both types of fluid are applied to aircraft, first the heated glycol/water mixture to remove contaminants, followed by the unheated thickened fluid to keep ice from reforming before the aircraft takes off. This is called "a two-step procedure". Methanol de-ice fluid has been employed for years to de-ice small wing and tail surfaces of small to medium-sized general aviation aircraft and is usually applied with a small hand-held sprayer. Methanol can only remove frost and light ground ice prior to flight. Mono-ethylene, di-ethylene and propylene glycol are non-flammable petroleum products and similar products are most commonly found in automotive cooling systems. Glycol has very good de-icing properties and the aviation grade is referred to as SAE/ISO/AEA Type I (AMS 1424 or ISO 11075). it is usually applied to contaminated surfaces diluted with water at 95 degrees Fahrenheit (35 °C) using a cherry picker on a truck containing 1,500 to 2,000 US gal (5,680 to 7,570 L; 1,250 to 1,670 imp gal) for on-ramp or departure runway entry point application. Colour-dyed fluid is preferred as it can be confirmed easily by visual observation that an aircraft has received a de-ice application. Runoff of Type I fluid appears to turn slush a pink tinge, hence the term "pink snow." Otherwise, all Type I fluids are orange. In 1992, the Dead Sea Works began marketing a de-icer based on salts and minerals from the Dead Sea. Boeing B-17 Flying Fortress. The black strips on the leading edges of the tail, stabilizers and wing are de-icing boots made of rubber. In-flight ice buildups are most frequent on the leading edges of the wings, tail and engines (including the propellers or fan blades). Lower speed aircraft frequently use pneumatic de-icing boots on the leading edges of wings and tail for in-flight de-icing. The rubber coverings are periodically inflated, causing ice to crack and flake off. Once the system is activated by the pilot, the inflation/deflation cycle is automatically controlled. In the past, it was thought such systems can be defeated if they are inflated prematurely; if the pilot did not allow a fairly thick layer of ice to form before inflating the boots, the boots would merely create a gap between the leading edge and the formed ice. Recent research shows “bridging” does not occur with modern boots. Some aircraft may also use electrically heated resistive elements embedded in a rubber sheet cemented to the leading edges of wings and tail surfaces, propeller leading edges, and helicopter rotor blade leading edges. This de-icing system was developed by United States Rubber Company in 1943. Such systems usually operate continuously. When ice is detected, they first function as de-icing systems, then as anti-icing systems for continued flight in icing conditions. Some aircraft use chemical de-icing systems which pump antifreeze such as alcohol or propylene glycol through small holes in the wing surfaces and at the roots of propeller blades, melting the ice, and making the surface inhospitable to ice formation. A fourth system, developed by NASA, detects ice on the surface by sensing a change in resonance frequency. Once an electronic control module has determined that ice has formed, a large current spike is pumped into the transducers to generate a sharp mechanical shock, cracking the ice layer and causing it to be peeled off by the slipstream. Many modern civil fixed-wing transport aircraft use anti-ice systems on the leading edge of wings, engine inlets and air data probes using warm air. This is bled from engines and is ducted into a cavity beneath the surface to be anti-iced. The warm air heats the surface up to a few degrees above 0 °C (32 °F), preventing ice from forming. The system may operate autonomously, switching on and off as the aircraft enters and leaves icing conditions. De-icing salts such as sodium chloride or calcium chloride leach into the soils, where the ions (especially the cations) may accumulate and eventually become toxic to the organisms and plants growing in these soils. The chemicals could also reach water bodies in concentrations that are toxic to the ecosystems. Steady increases in salinity (aka freshwater salinization syndrome), leached metals, and dissolved potassium and magnesium salts all throughout North America and Europe have been observed in lakes and rivers, due to road salt and its knock-on effects. Organic compounds are biodegraded and may cause oxygen-depletion issues. Small creeks and ponds with long turnover time are especially vulnerable. In one case, a significant snow in Atlanta in early January 2002 caused an overflow of such a system, briefly contaminating the Flint River downstream of the Atlanta airport. The toxicity of de-icing fluids is another environmental concern, and research is underway to find less toxic (i.e. non-glycol-based) alternatives. Wikimedia Commons has media related to De-icing of aircraft. ^ 2012 Autumn & Winter Season (Drivers' Briefing). London, UK: First Capital Connect. September 2012. ^ a b c d e Technical Development Document for the Final Effluent Limitations Guidelines and New Source Performance Standards for the Airport Deicing Category (Report). Washington, D.C.: U.S. Environmental Protection Agency (EPA). April 2012. EPA-821-R-12-005. ^ a b c Environmental Impact and Benefit Assessment for the Final Effluent Limitation Guidelines and Standards for the Airport Deicing Category (Report). EPA. April 2012. EPA-821-R-12-003. ^ Rosenlof, Kim (2013-10-02). "Infrared De-icing Speeds Process and Reduces Cost". Aviation International News Online. Midland Park, NJ. ^ APS Aviation, Inc. (December 1998). Deicing with a Mobile Infrared System (Report). Montreal, Quebec. Report prepared for Transport Canada. ^ "Ice Cat Aircraft Deicing System". Bonner Springs, KS: Trimac Industries. 2004. Retrieved 2016-05-29. ^ "Airport Deicing Effluent Guidelines". EPA. 2016-04-21. ^ Amanda Rabinowitz (February 25, 2008). "Beets Part of New Recipe to Treat Icy Roads". National Public Radio. ^ Richard J. Brennan (January 21, 2012). "Beet juice melts ice from winter roads". Toronto Star. ^ "About Magic Salt". 2007. Archived from the original on 2009-06-05. ^ "Thermal Energy Storage in ThermalBanks for under runway heating". ICAX Ltd, London. Retrieved 2011-11-24. ^ Nosonovsky, M.; Hejazi, V. (2012). "Why superhydrophobic surfaces are not always icephobic". ACS Nano. 6 (10): 8488–8913. doi:10.1021/nn302138r. ^ Hejazi, V.; Sobolev, K.; Nosonovsky, M. I. (2013). "From superhydrophobicity to icephobicity: forces and interaction analysis". Scientific Reports. 3: 2194. Bibcode:2013NatSR...3E2194H. doi:10.1038/srep02194. PMC 3709168. PMID 23846773. ^ Cunningham M.A., Snyder E., Yonkin D., Ross M., Elsen T. (2008) Accumulation of deicing salts in soils in an urban environment. Urban Ecosystems. ^ "Saltier waterways are creating dangerous 'chemical cocktails'". ^ Tom Gibson (September 2002). "Let the Bugs Do the Work". Progressive Engineer. Retrieved 21 February 2011. ^ U.S. Federal Aviation Administration. Airport Cooperative Research Program (April 2010). "Alternative Aircraft and Pavement Deicers and Anti-icing Formulations with Improved Environmental Characteristics." Research Results Digest 9.